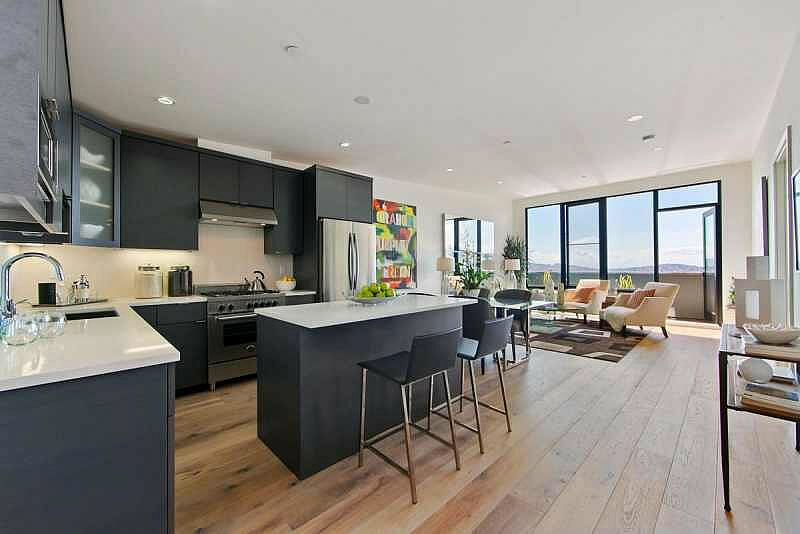 Two months ago, a brand new 786-square-foot one-bedroom condo atop “The Century” at 2200 Market Street was purchased for $949,000 ($1,207 per square foot). Having decided against a move to the city, the buyer put the condo back on the market a month ago listed for $899,000 with the space staged by Arthur McLaughlin as the buyer never moved in. 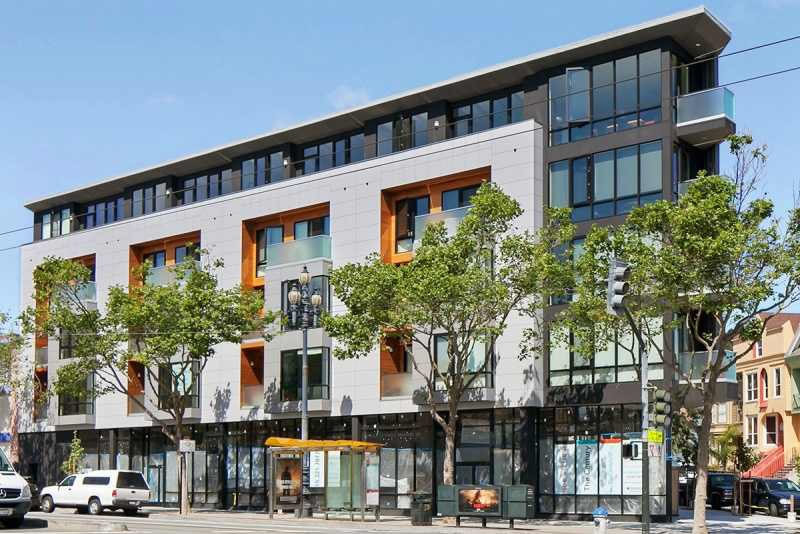 Today, the re-sale of 2200 Market Street #502 closed escrow with a reported contract price of $1,050,000 ($1,336 per square foot). And no, that doesn’t include a parking spot nor any improvements to the space. Have we mentioned The Deal of The Century? $1300 per square? This is not going to end well. probably not making much after having to pay sales commission (6% or 63k), transfer taxes (0.75% or 8k) as well as property taxes and HOA fees for a couple months (I’ll guess about 2-3k), plus at least 1-2k for closing costs times two (buy and sell). Probably didn’t lose money, but not exactly walking away with much either. Plus capital gains tax owed to the IRS? Sales commission would’ve been 5, not 6. Anyway the point is they should have taken a bath and they didn’t, they actually unbelievably turned a healthy profit on what wound up being a two month deal. Minus the expense and before tax, let’s say the flipper make 30k from an investment of 849k. That is 3.5% in one month. Stock market fluctuation easily exceed this amount. It is hardly news worthy for someone make 10-20% a month in the stock market. The real estate commission is like a 6% sales load on mutual fund. It is not really great vehicle for short term investment. This flipper get lucky one time and make a little bit of money. Next time don’t expect the purchase to appreciate fast enough to cover the transaction cost so quickly. Does anyone have any idea of the approximate cost of this sort of staging? A space that size would be anywhere from $5,000 – $8,000. That’d include the furniture rental for 45 – 60 days, delivery, and setup/removal. Just for the fun of it, for this same amount you could live in a castle in France and have your own MOAT . Instead your moat will be the urine scent of the homeless hordes who crowd this area of Market street past midnight. I’ll take the French castle please! Or in my case this price would buy a very nice already remodeled mid century home with pool on golf course in the Palm Springs area. The Southern California desert resort communities are loaded with former San Franciscans who cashed out and moved south. If you did that, I hope you kept a crash pad for the 5 months of 100+ degrees. I made my move to the desert and am so lucky I have several plan Bs for the summer. btw, have you ever experienced life on a golf course? Be ready to invest in reinforced exterior glass panes, and time your swims properly if you have a pool facing the course. Many people are horrible at golf. But you can make a pretty penny on second hand Callaway golf balls. Golf balls mostly go in the pool, and yes it gets warm, but we have amazing ac. and our pool is kept cool so I actually love the summer evenings with 11am till 5pm being “indoor hours” during July through September. One local escape is to drive 30 minutes up to mountain lakes near Idyllwild and take the dogs running with summer temperatures up there in the 60’s and 70’s. Our San Francisco friends seem to love the heat and I’ve noticed the area is flooded with European tourists in the summer who seem to like it hot. I have friends who just stayed at the Amangiri, the posh resort in the Utah desert, and they said the whole hotel was full of Europeans who come in the summer for the heat. We also rent a place usually in Laguna Beach or up near Cambria or Carmel to get out of the heat also. BTW- to be “on topic”, despite the price, I do love the scale and design of the building and hope to see similar infill projects throughout the city. Would love to see a project like this up in 94123. European tourist come to the desert in the summer because 1) they can not imagine heat going north of 100, 2) Many Europeans have a month-long vacation in the summer and several week-long trips during the year. Companies will “kindly ask” their employees to take their long vacation during July or August. Also school is out 2 month usually, and for a long trip like the US, July and August it when you can move the kids around. Plus some charter planes will run only during the high season. I should know, I was an office drone in my pre-dotcom years with 6 weeks of vacation a year and way more time than money. Then I came here and when friends and family visit, they all want to see the sights, Utah and such. I tell them: not in the summer! Nope. July. And. August. Every. Time… Sigh. We are starting the design process for our new home on a piece of land in the PS community. And yes, lots of SF friends cashing out and moving there. My take on (most) of the remodeled mid-century homes: overpriced, very small and generally not insulated well, out in the windy areas and near the airport. My take on the golf courses: horrible waste of limited water. They will have to adjust to severe water shortages very soon. Lawns around homes should be heavily taxed. The lawns are largely a relic from the past. Our new home will have zero lawn, simple desert landscaping, an all steel framed house, heavily insulated and shaded., simple, clean modern and NOT faux Tuscan/French med. @futurist…..did you look out towards Indian Wells or Rancho Mirage? Our home is not truly “mid-century”, but a late 70’s Steve Chase / Holden & Johnson contemporary. (If you know who those people are) but has a low-flat mid century vibe. We do not have memberships on the course we live on, but enjoy the views and remember, the Coachella Valley has a substantial underground water source. Our landscaping is a desert scape and was created by Ron Gregory. No didn’t look there. Wanted only PS near downtown, somewhat walkable. (which I know is strange for PS). Steve Chase did some interesting work in the 70’s. We prefer ‘hoods like Vista Las Palmas, Araby, Andreas Hills and the south neighborhoods. Yes, the water issue is a serious ones, and yes I hear both sides. But the amount of green lawns is really insane for a desert setting. @Futurist, If you go out towards the newer communities (Bighorn, Stone Eagle or The Reserve) you will see that they are now all only doing native desert landscaping (except for golf courses) and no faux Tuscan. We have good friends who just built out at “The Quarry” in the hills above La Quinta and it is all desert landscaping and the setting is jaw dropping beautiful. You will enjoy all this after you settle in and start exploring the surrounding communities. No offense, but I wouldn’t be caught dead at those golf course communities you mentioned. Insanely over-blown square footage, not modern, but yes Faux Tuscan/modern homes. Not my style. Ever. My modern is in the style of work by the firm 02 Architects in Palm Springs: unpretentious houses that are truly designed for that climate and never meant to impress. Cost us $3000 to stage our 2BR condo a couple of years ago. We did not shop around but just took the guy our realtor proposed (had way too much going on at the time to hassle with that) , so I have no idea if that is “market” but I suspect it is as I trust our realtor. Really fortunate result for the seller to come out a couple $10,000s ahead. I have no idea what the new buyer is smoking. Crazy. I dropped by the open house here a month ago. It was very nice, although I’d prefer an office area/den to an extra half bath and a hallway. The noise from Market street was pretty loud and I was shocked that at that price, it didn’t come with parking. It’s amazing what underpricing a home can do these days. FYI Futurist, the Coachella and Imperial Valley Irrigation District has “senior water rights” for Colorado River water. So unless legislation is passed taking those away, the golf courses will be around a long while. In the west, the historical first users of water gets first dibs, even if they are downstream. Well, with sales volume dropping and inventory rising hope this buyer tends to stay for awhile. or maybe he’ll sell in a month for another $101K more? This is a crazy market. Yeah, with UBER valued at $18 billion and condos going up in value six figures month to month it does seem like SF has seen this movie before. I wonder what will happens if SF RE gets hit a third time within 15 years. Well, the last bubble was national. Right now the rest of the country hasn’t recovered the bubble prices from 8 years ago. 8 years is almost a full cycle in RE years. Then again, one thing to keep from the current Piketty-mania is the fact that wealth concentration is accelerating. This means lower and middle class by themselves can’t prime the pump that could start the national bubble #2. What’s left is lending standards and it seems like they are being slowly relaxed. I think this is a bubble, that it has gone out of control, but I also think that the normal cycle is affected by the crazy dichotomy of today. The only thing that could make a dent is a stocks crash, but I feel we’re in for a good 2 years of stock market growth. Maybe a good number of redundant tech startups will fail, but there is so much cash that it will take some time to affect RE prices. Anyway, a New Gilded Age it is. I am cashing in and doubling up, but not in SF. Too bubbly for my blood. I’m not predicting any imminent “crash” or even price decline from those stats. But I must admit I’m astounded at recent prices. We bought our house just a little over two years ago not far from this place and had no competition – even had a price decline before we offered (the only offer). there was some competition we faced then for top quality SFRs with a rental unit (got outbid on two of those), but it was pretty easy to get a place. Now I see small condos like this place going for not much less than we paid for a 4BR house with a garage and a yard on a better street. 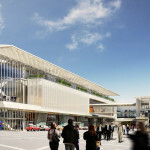 Either we are in a “bubble” or SF really has undergone a monumental change. I’m just glad I don’t have to deal with it, and I really feel for those looking to buy or rent as that would be really stressful. Staging on a 2br is $5-6K, so this should be less. There are no capital gains if this was a primary residence. No time to google it now, but my guess is that since the holding time was so short, there should be no cap gains even though he never moved in. This price is nuts, but the market is irrational right now IMO. If he made a profit, there will be capital gains. it will be short-term capital gains and taxed as ordinary income. The benchmark is NYC and Hong Kong. Figuratively and literally. Barf. They will have to pay capital gains. In order to avoid that, you have to live in the place at least two years out of the five years prior to its date of sale. But who cares? They had a gain on which to pay taxes! After the transfer tax, commission, staging fee, carrying costs, there’s not going to be a whole lot of profit to be taxed. Know someone that lives here, and I’m astounded at the price for this (having stayed overnight and listened to the continual noise of the F-line streetcar, lots of screaming from sidewalk traffic late into the night, and normal ambulances/fire trucks/police cars along Market Street). The person sold a house in the Northeast prior to moving to SF, however he is not a “tech” person. The kicker for me is no parking!